Found this recipe for an "Anytime Casserole" in a newspaper years ago in an article about River Run Bed and Breakfast. It was one of their guests favorites and has become, with many variations, a favorite of my family and the many who we've shared the recipe with. It works real well when you have a large group to feed or when you want to do the preparation the night before and just stick it in the oven at breakfast time. Prep time 30 minutes, best if it can be refrigerated for an hour or overnight before cooking. Cook and crumble the sausage, drain. Mix eggs, salt mustard &amp; milk in large bowl. Cover 8 X 11.5" casserole with cooking spray. Put crumbled bread pies on bottom of casserole dish. Layer sausage then cheese over the bread. Cover with foil and refrigerate 1 hour or overnight. Sprinkle with parsley flakes for color. Cuts into neat squares. Can be served with picante sauce or country gravy. If you're tent camping, you can mix all the ingredients together in a bowl and pour into an iron dutch oven and cook over coals 30-40 minutes till golden or till knife inserted near the center comes out clean. 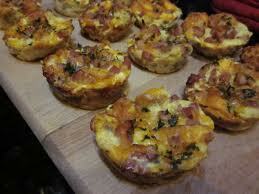 Nice presentation for a crowd: follow same directions but using a muffin tin, filling each cup with the bread, meat, cheese then egg mixture. My favorite- substitute mushrooms for the meat with added leaf spinach and Swiss cheese.